This story was updated on Wednesday. Dec. 10 at 9:15 a.m. ET. Two new species of so-called pseudoscorpions have been discovered in a cave on the northern rim of the Grand Canyon. The elusive creatures, which have adapted to their lightless environment by losing their eyes, were discovered in Grand Canyon-Parashant National Monument, which abuts the better-known Grand Canyon National Park. Unlike true scorpions, these scorpion imposters lack a tail with a venomous stinger. Instead, the arachnids use venom-packed stingers in their pincers to immobilize their prey, study author J. Judson Wynne, an assistant research professor in the Department of Biological Sciences at Northern Arizona University, in Flagstaff, wrote in an email. The researchers first discovered the two false scorpions during expeditions in a cave along the north rim of the Grand Canyon, between 2005 and 2007. But it took years before the team identified the species as unique. “Contrary to popular belief, rarely are we in the field, collect an animal and then brandish our grubby field flasks of whiskey to toast a new species discovery,” Wynne told Live Science in an email. To confirm the scorpion lookalikes were a new species, the team had to take them back to a taxonomic specialist, who analyzed all the details of the species and pored over all the existing data on similar species. In this case, the team found that one of the species had a thickened pair of legs and a mound on the pincer, while another had a much deeper pincer than other pseudoscorpionsqualifying each as a distinct species, study co-author Mark Harvey, senior curator at the Western Australian Museum in Perth, said in an email. The creatures, dubbed Hesperochernes bradybaughii and Tuberochernes cohni, respectively, are about 0.12 inches long and feed on tiny invertebrates, including springtails, book lice, mites and possibly cricket nymphs. Many of their prey are just one-fourth the length of a grain of rice. The two species are named after Jeff Bradybaugh, an advocate for cave research and the former superintendent of Grand Canyon-Parashant National Monument, and Theodore Cohn, an entomologist who identified a new genus of cave cricket and passed away in 2013. The fact that two separate species of pseudoscorpion can live in the cave while competing for the same food source suggests the cave supports a robust food web. The cave is one of the largest roosts of crickets in northern Arizona, and the pseudoscorpion prey feed on the cricket “frass,” or poop, as well as the fungus that grows on the poop. The cave is also home to a bizarre, eyeless fungus beetle that feeds on the poop fungus. At one time, the pseudoscorpions’ ancestors lived in the desert environment outside the cave, but they have since adapted to hunting in an environment devoid of light, losing their eyes and gaining an elongated bodies in the process. In general, pseudoscorpions are odd creatures. Not only are their pincers good for immobilizing prey, they also help the insects hitchhike to new locales. “They will grasp onto another animal such as birds, mammals and even other insects. They hold on and can be transported long distances,” Wynne said. This allows the insects to travel farther than they ordinarily could, so they can mate and disperse genes farther than they could walking on their own eight legs. These journeys may also take the scorpions to better hunting grounds, although there’s no guarantee that the next spot is better than their previous one, Wynne said. But the pseudoscorpions aren’t just freeloaders; they help their animal hosts by devouring parasites such as mites. The new species were described in the November issue of the Journal of Arachnology. 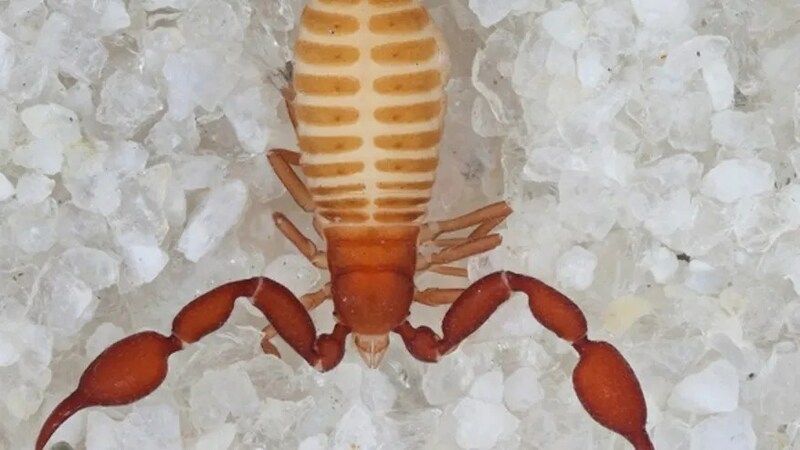 Editor’s Note: This story was corrected to note that pseudoscorpions don’t have a tail and that the ancestors to the cave pseudoscorpions probably lived in a desert environment, not a sunny one.